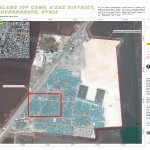 A collection of satellite photos depicting refugee camps in Syria, Jordan and Turkey fleeing the ongoing conflict in Iraq and Syria. It is estimated that over four million people have been displaced according to a U.N. report released in early July. In terms of enforcement of competition rules, the number of decisions taken increased in 2008 compared to the previous year. While the number of merger and exemption cases increased significantly, the number of cases in the area of competition infringements (cartels, vertical restraints and abusive practices) decreased. The increasing number of exemption applications is quite striking in 2008. The main explanation for this increase comes from the introduction of 40% market share threshold in the Block Exemption Communiqué on Vertical Agreements. The agreements previously exempted lost their exempted status after the introduction of the threshold.